The UAX220-Mic from Digigram is a USB , 2 channel, microphone/ line digital audio interface that can be used with both USB 1.1 and 2.0 ports (performance will be based on USB 1.1 regardless of type used). The unit can be switched between either a laptop computer for portable use, or plugged into a desktop computer in the studio or broadcast facility, allowing for very flexible use. Especially useful for the journalist on the go, the unit provides 2 high-quality microphone preamps with individually switchable +48V phantom power. Low latency monitoring is available, as is the ability to pre-mix signals to mono. Additionally, the unit provides a very compact solution for FOH mixers for doing sound checks. With the appropriate measurement software and a pair of measurement microphones, very accurate readings are possible. The interface is automatically recognized by the host software as soon as it is plugged in, obviating the need for additional drivers installation. The captive cable provides XLR connectors for the inputs and outputs, which can operate balanced or unbalanced. The UAX220-Mic is USB bus powered and does not require any external power supply. Box Dimensions (LxWxH) 12.7 x 5.7 x 3.9"
UAX220-Mic - USB 1.1 Audio Interface is rated 4.8 out of 5 by 4. Rated 4 out of 5 by Christopher from OK on the new PC So far I've only used it to listen to my audio. When I tried it on the old PC it was unusable, there was bad interference. It started with clicking but ended up as a high pitched screeching. I promptly put it away and waited for the parts for the new PC to arrive. Since then I've been using it on the new computer for over a week with no problems. The new PC's motherboard is an ASUS Prime X470-Pro. The old one a Gigabyte P55A-UD4P, which to be fair is over nine and a half years old and it's been used seven days a week over that time. Still if anyone else the same experience it might be the computer not the Digigram UAX220 that's the problem. Rated 5 out of 5 by Jakeis02 from HIdden Gem! I use this for a live set up running Logic/Mainstage out from my lap top to a PA. 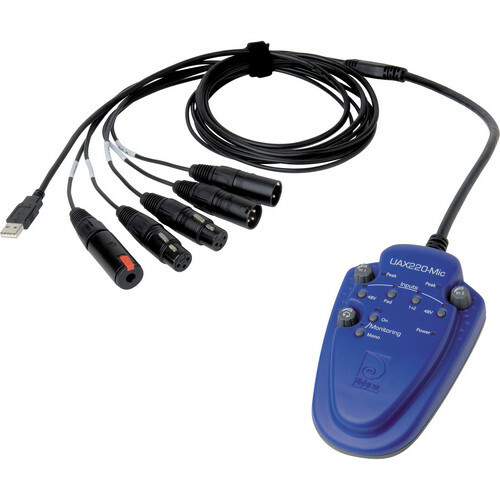 This item is unique because it's perhaps the only 2 channel, portable usb interface with BALANCED OUTPUTS. I run my vocal mic into it as well as midi keyboards out. Everything works great. Sound is good. Price is right. Very happy. Rated 5 out of 5 by Anonymous from Most Professional Gear fully portable Due to its USB slot this state of the art sound card is the one you would choose if you are a broadcaster or professionally record sound on journey. B and H sells these at a budget price. Seen same for twice as much at some retailers.